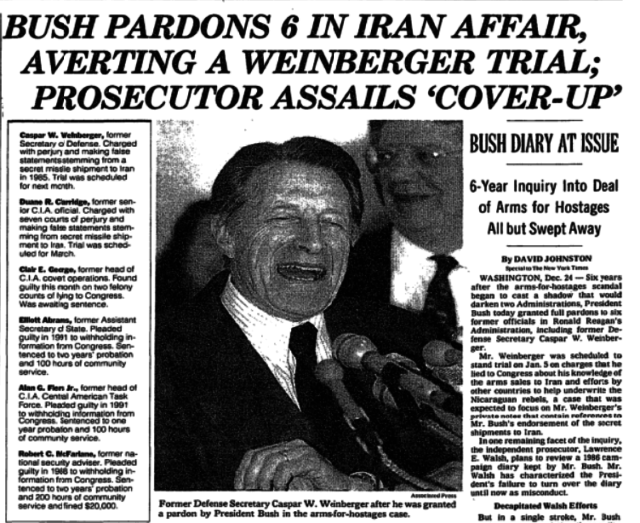 Lame duck President George Bush Sr. gave a Christmas present to Iran/Contra co-conspirators like Caspar Weinberger–and to himself (New York Times, 12/25/92). The Iran/Contra scandal revealed, among other things, that the Reagan/Bush White House had secretly sold missiles to Iran in exchange for hostages held in Lebanon, using the proceeds to fund right-wing forces fighting the leftist Nicaraguan government in violation of US law. The attorney general for Bush who approved the pardons, William Barr, is now being nominated for the same position by Trump. Is this background relevant? Though current news columns are rife with speculation that Trump might likewise protect himself by pardoning his indicted or convicted associates, the dominant US news wire service doesn’t seem to think so. 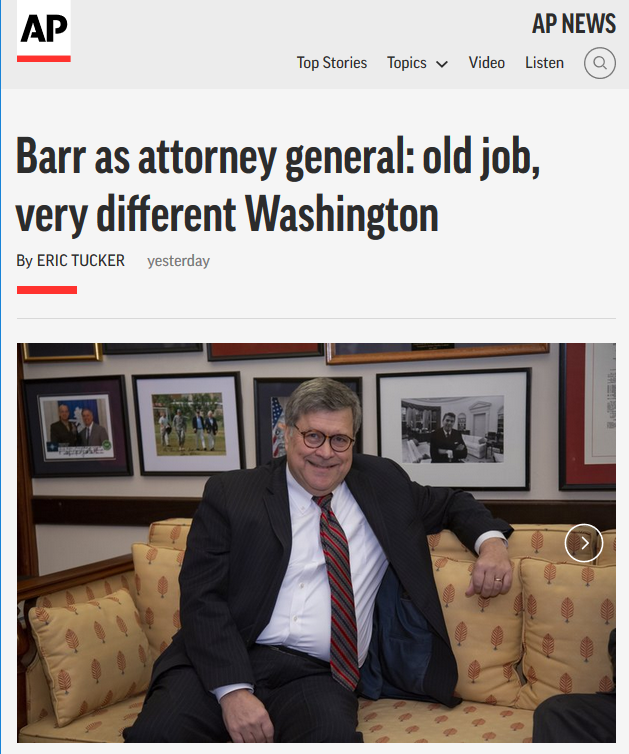 AP (1/14/19) describes Attorney General-nominee William Barr as “principled, smart and strong-willed”–not to mention a good person to have as your friend if you’re a Justice Department reporter. The false implication is that Bush did not himself face intensifying investigations from Lawrence Walsh, who operated out of the Justice Department’s Office of Special Counsel. The misleading comparison is compounded by Tucker describing Trump as “breaking with the practice of shielding law enforcement from political influence” and ousting Attorney General Jeff Sessions for “not protecting him in the Russia investigation” – as if Barr didn’t have direct experience in the first Bush administration with imposing political influence on law enforcement to protect a president from investigation. The Republican independent counsel [Lawrence Walsh] infuriated the GOP when he submitted a second indictment of Weinberger on the Friday before the 1992 elections. The indictment contained documents revealing that President Bush had been lying for years with his claim that he was “out of the loop” on the Iran/Contra decisions. The ensuing furor dominated the last several days of the campaign and sealed Bush’s defeat at the hands of Bill Clinton. While much of the media obsesses over every bit of “Russiagate,” some breathlessly anticipating the next revelation will surely bring down the Trump presidency, it’s remarkable how little interest there is in the trajectory of presidential power. AP‘s actions also fit into the institution-protecting mode of what Parry derided as the “conventional wisdom” – which in its current formulation depicts Trump’s authoritarian tendencies as aberrations from the norms of US politics, rather than a continuation of the worst tendencies of his predecessors. Messages to Associated Press can be sent to info@ap.org (or via Twitter @AP). Please remember that respectful communication is the most effective. Sam Husseini is senior analyst at the Institute for Public Accuracy. He’s also set up VotePact.org – which helps break out of the two party bind. His latest personal writings are at http://husseini.posthaven.com/ and tweets at http://twitter.com/samhusseini. This originally appeared at Fairness & Accuracy in Reporting.